Home › Culture › arts & entertainment › This is what you meant isn’t it? This is what you meant isn’t it? .. when you said you want to wear white and be a princess for a day? I know someone who did that! Seriously, my husband’s cousin and his partner had a Vegas wedding in the middle of a sci-fi convention, with everyone in theme-appropriate fancy dress, and the bride was, in fact, dressed as the heroine above. Unfortunately we missed the wedding because I was in my third trimester and not allowed to fly, which meant I was cheated of the chance to costume myself as the character I most resembled at that time – Serenity. Yes. Yes it is. Now where’s my damn laser gun thingy. My daughter is 4 years old and is being invited to quite a few princess themed parties. Now how can I send her along as Princess Leia? Star Wars saturation sessions are the only answer. 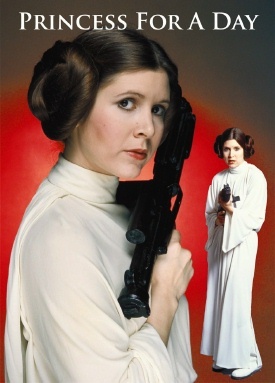 Since Leia is the only major female part, the urge for identification should be strong with this one. Oh, yes. So very, very yes. Ooh! Found a blog post I wrote about this! If you have to be a princess, she’s a good one to be. liz – so adorable, thanks for sharing. Gah, I can’t believe that I never thought of this princess option. However, I don’t think we are out of the princess years just yet so I may have the opportunity to use this. Lucky she already loves Star Wars.